This summer, I finally got around to uploading Linus-themed designs to Spoonflower. I ordered a couple of fat quarters instead of the regular 8x8" swatches. 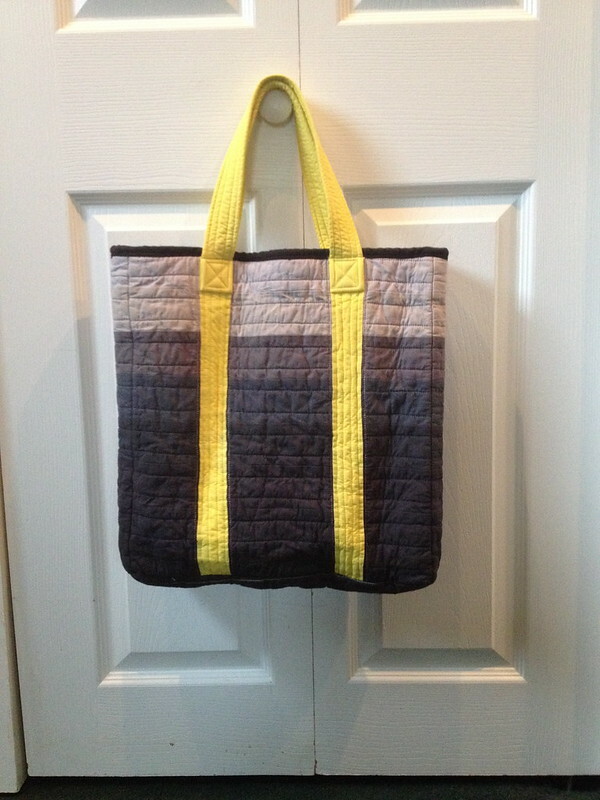 I wanted a new giant tote bag with a lot of pockets for myself, but I couldn't find any patterns or tutorials online that had everything I wanted, so I just improvised off some rectangle shapes and things I had learned from making bags in the past. 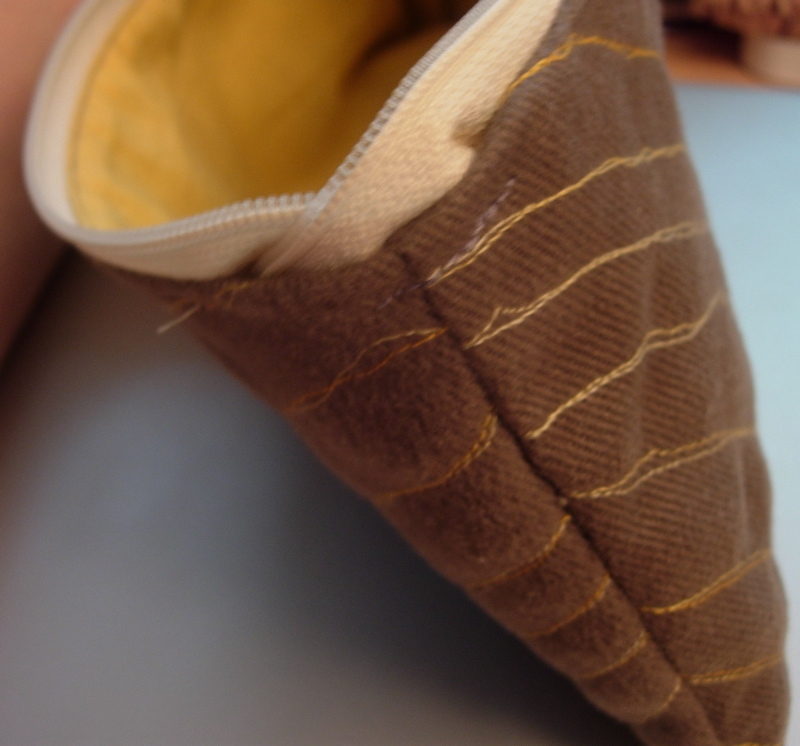 I used this zippered pocket tutorial for sewing the inside zipper pocket. There are things I would change a bit if I did it over again, but it's pretty sturdy and I like it a lot! 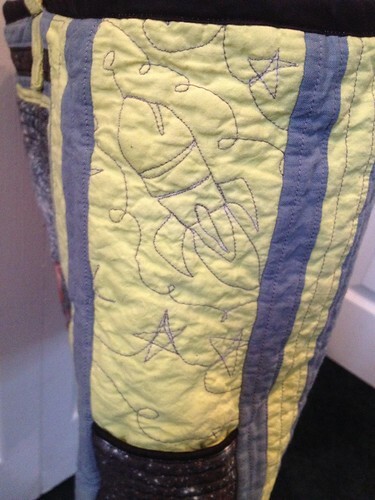 The sides have panels of the Linus fabric in the middle, pieced bits of hand-dyed chartreuse and grey fabric around them. 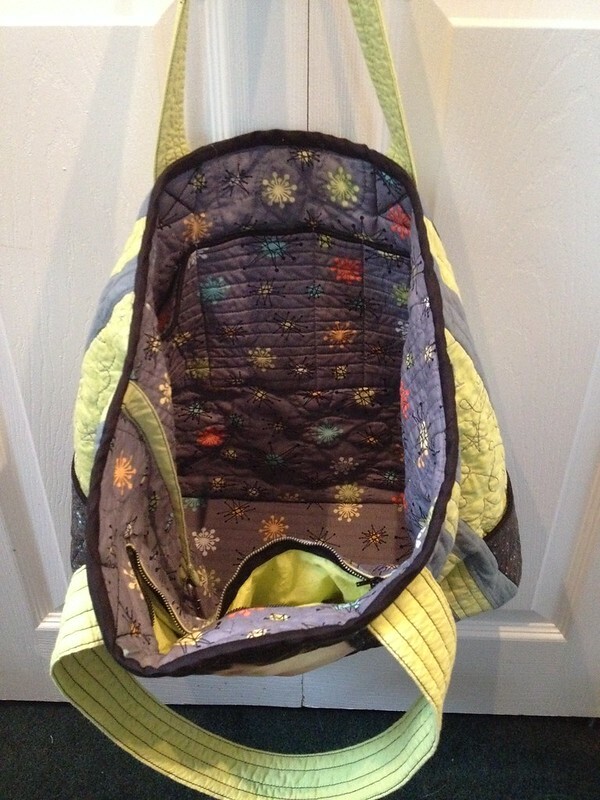 The inside has five different-sized slip pockets (sunglasses, phone, pens, wad of Starbucks napkins), a zip pocket, and a key fob. 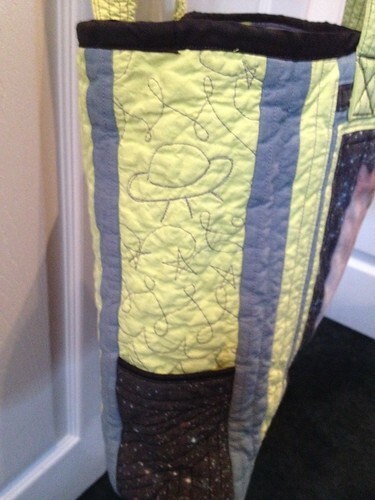 The fabric is Star Jacks from Michael Miller Fabrics. 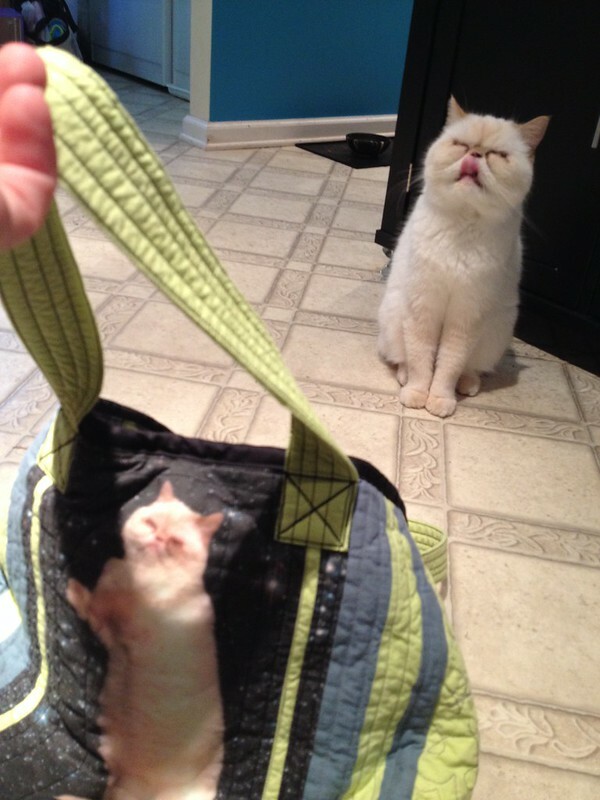 Linus himself was unimpressed and wouldn't get inside the bag when I tried to tempt him. Thbbbppppp he says. 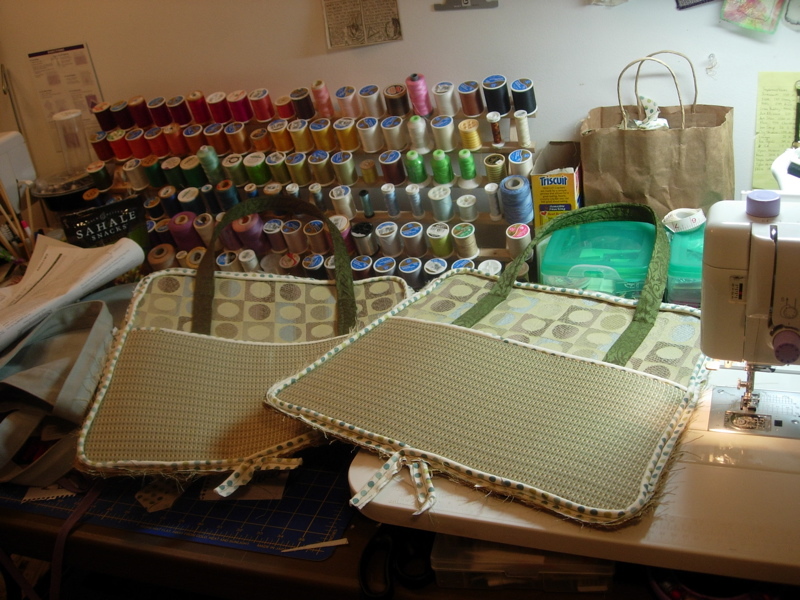 Several years ago I made the pleatness bag from a tutorial on Craftster. I made two, actually. I was enamored with the prints I was using and failed to pay attention to how the fabrics would hold up, and didn't pick my thread carefully.. The first one made it for a little while, but was very floppy and kind of unusable. I did a much better job on the second one, but didn't realize that I used serger thread instead of regular thread to put it together. Stitches were skipped. Seams were coming loose. It was fine for a while but I eventually gave it up and used other bags. It's been sitting in my closet for two and a half years. 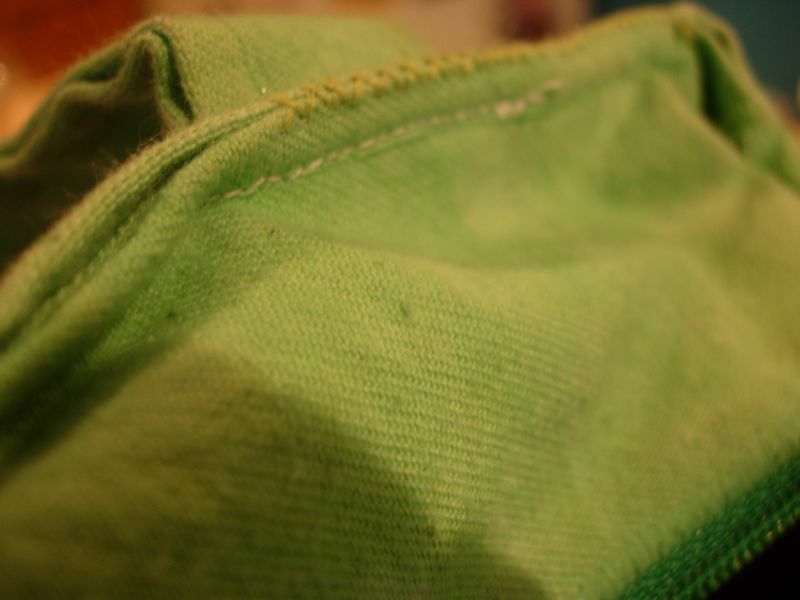 I finally fixed the most egregious things: The seams across the top needed to be reinforced, and the bottom needed a stiff insert so it wouldn't fold up so much. DONE! 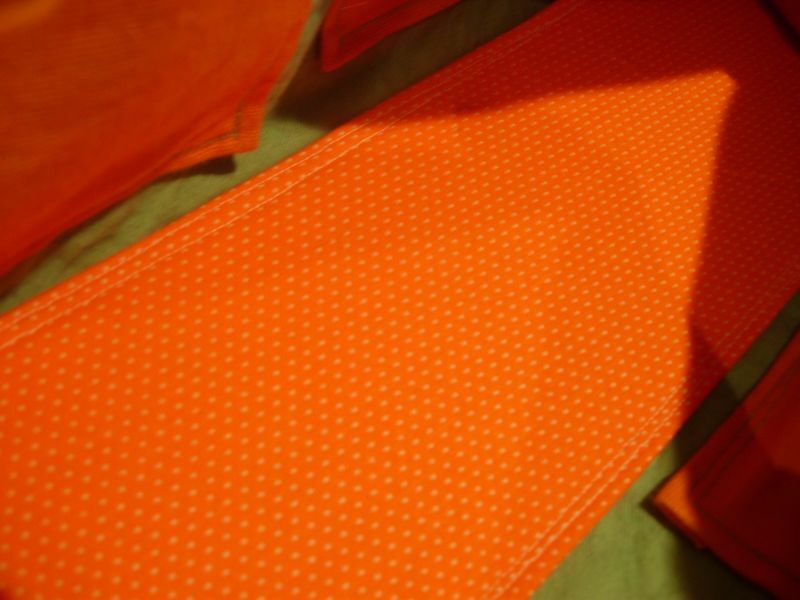 I'm happy I'll be able to use it again, because I love that metric system fabric! Soooo my six-year-old PowerBook had a bad bit of hard drive failure in the middle of May. I wasn't super distraught, as it was no longer my primary computer, but I do enjoy couch internet quite a bit and was looking to replace it. I was also looking to replace the six-year-old click wheel iPod I'd gotten at the same time as the Powerbook. This ended with me buying an iPad to replace both. Whoops. All the cases I've found are sold out, prototypes, or things I don't really like. 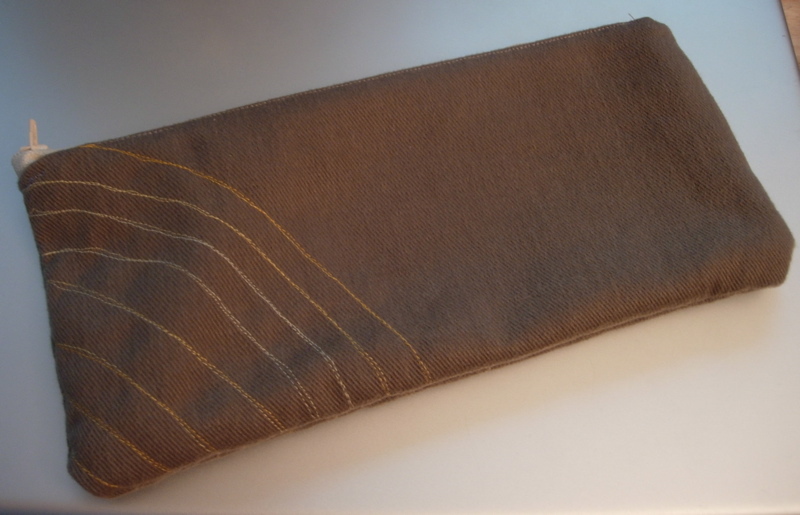 Sewing machine to the rescue: I threw together a simple soft sleeve in a couple of hours, just to keep it from getting damaged in my bag until something better (with a stand!!) comes along. 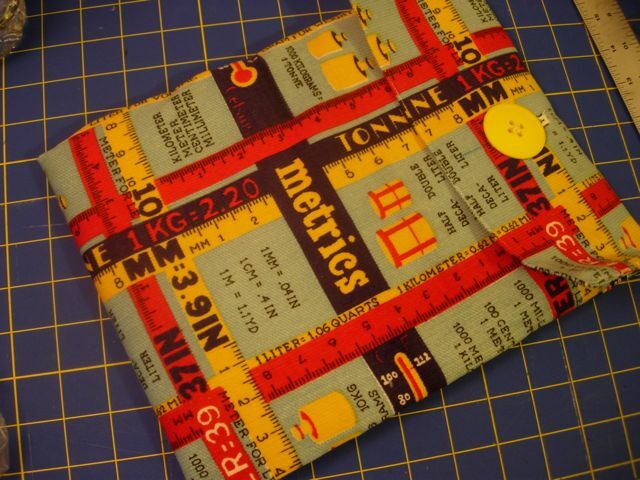 This metric system fabric is my greatest thrift score of all time. 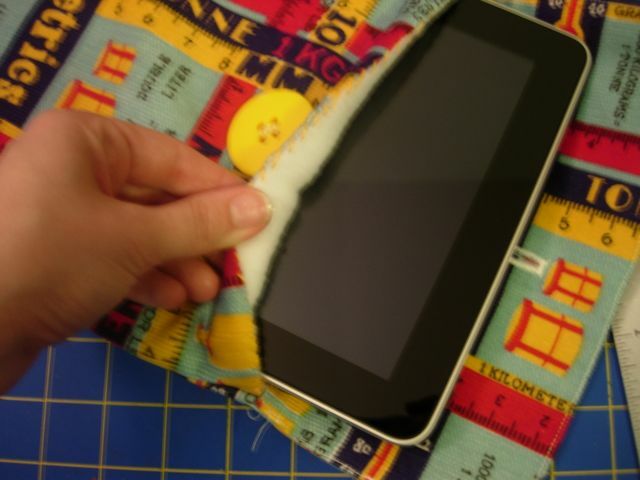 Fleecy fabric inside to prevent scratching. Red is not my color. Almost all my clothes are coooooool - blue, green, violet - I'm the ocean, look at me. 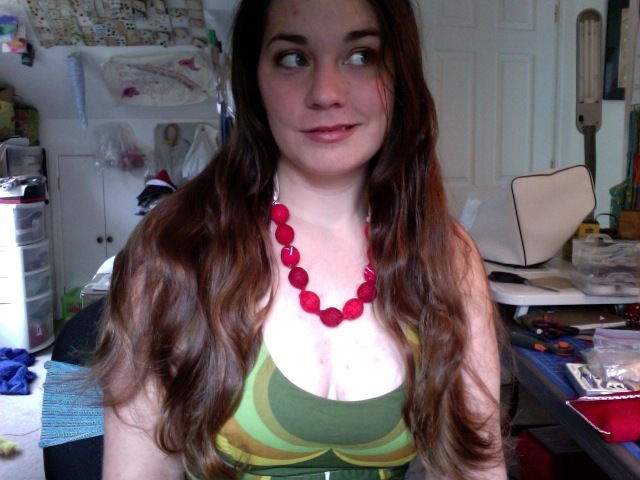 So I have this dress in a fantastic mod print of all olive and mustard shades, and I was going to a wedding, and I needed some accessories. Red may not be my best all-over shade, but it's good here! It fit all the important stuff. stripey, patchy. clouds? no. tote bags! 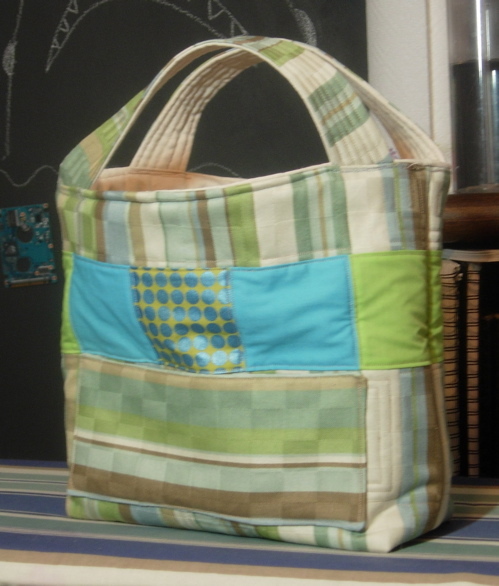 I used the Quilted Garden Tote tutorial from Sew, Mama, Sew! 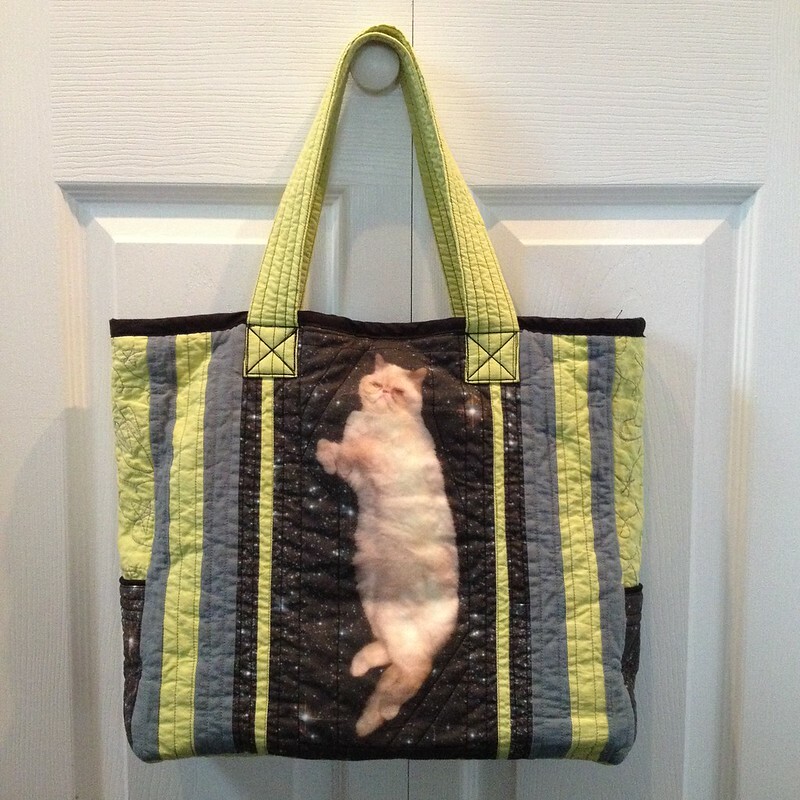 to make this stripey, patchy tote for my mom. 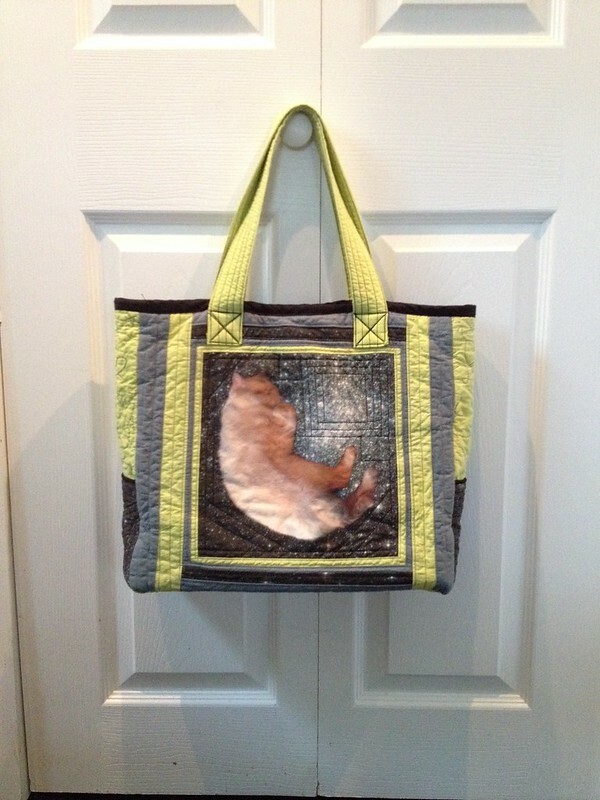 The bag has been finished. It's so heavy now that it's done, too! We did a bit of a test run today and used it as a fourth shopping bag on our grocery trip today. Being that the bottom didn't fall off when it was full, I think it's going to last a while. Huzzah. Lately, I've been doing work on pieces for Wandering Alice. My day job has been busy and we've had social things to do too. So my for-me and for-etsy making has been a bit stalled. Unfortunate! 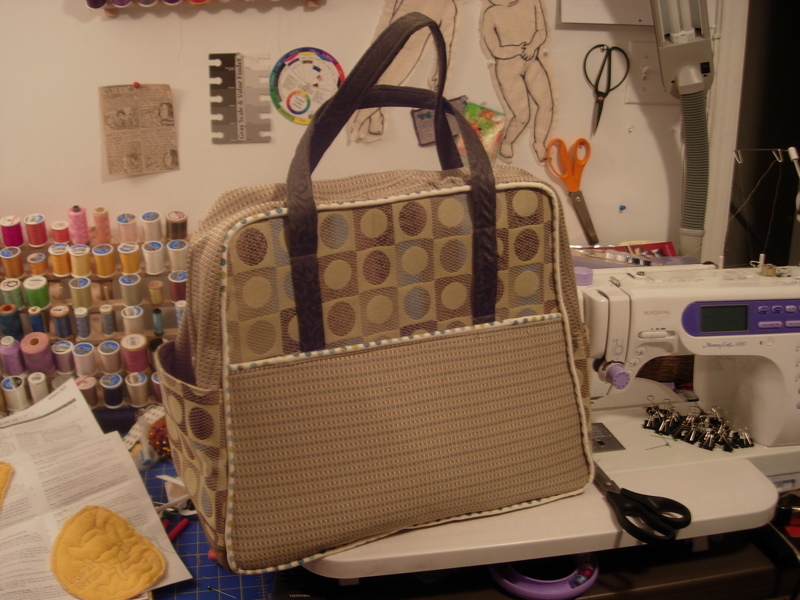 I've been working on the Amy Butler Weekender Travel Bag. It's going a bit slowly. 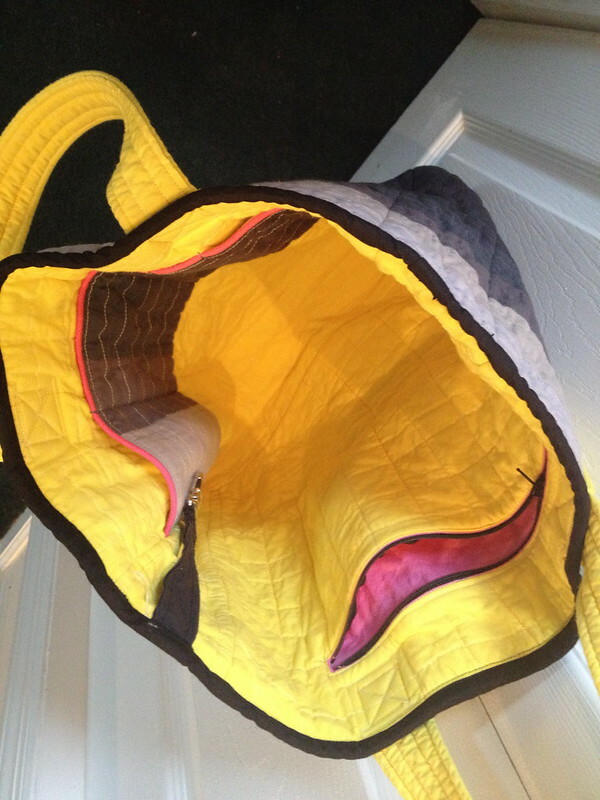 I made the main side panels last week, and last night did the outside top part with the zipper. 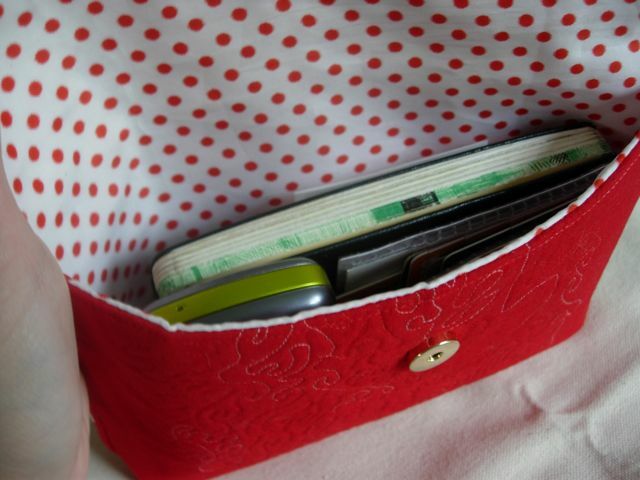 When I got to putting the pockets onto the top part, I made them upside down! Fool. Sooo.. I stopped there, and have to recut those pieces before I can move on. 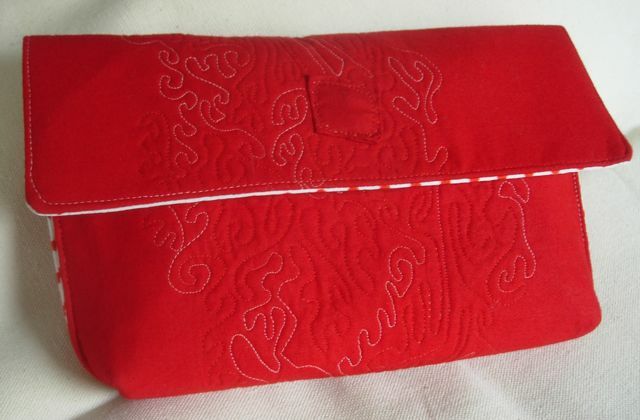 Pattern sewing is not really my strength, but this bag will probably turn out all right. Here's a shot of the finished sides. Woohoo for first-time piping! I've also been working on going through stacks of paper and ephemera I've collected over the years. Instructional stuff and usable bits of stuff have been catalogued into manila envelopes, binders, and folders. The rest is newspaper clippings, printouts, and pictures which I've started taping into my current sketchbook. I was doing some of that last week while watching Akira. Then I got sidetracked and drew a coelacanth.